Ashton Town Hall, completed in 1840, is one of the North of England’s best examples of early Victorian civic architecture. The façade – with its Corinthian columns, grand steps and balustraded parapet – is a solid and imposing structure that dominates the market square in Ashton, near Manchester. The building was extended in 1878 to accommodate extra administrative activities. Tameside Council undertook an inspection to a detached section of plasterwork and discovered the timbers behind were affected by dry rot. It became apparent that damage had also been sustained to the historic and highly-detailed plaster ceilings. English Heritage and The Society for the Protection of Ancient Buildings (SPAB) advised the council how to proceed with the repairs and submitted recommendations for suitable materials and procedures. 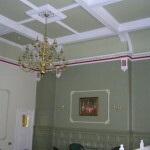 Ornate Interiors won the contract through competitive tender, subsequently working directly for Tameside Council. Two ceilings were badly damaged, but because these were constructed in different ways two contrasting solutions had to be found. One involved the replacement of haired lime plaster onto oak laths followed by hand-restoration of plaster mouldings. The second, probably part of the later extension work, required the manufacture of fibrous plaster casts with embellishments. These were cast in the Leeds workshop and transported to site where they were fixed to the new timbers and blended in by hand. Restoration was also carried out to cornices, friezes, capitals, vaulted panels, acanthus-leaf embellishments and ribs. A new corbel bracket, in keeping with the existing design of the room, was also designed and moulded. Ornate Interiors completed a challenging one-month works programme one week ahead of schedule.